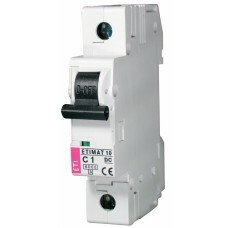 Automatic circuit breakers are used to protect electrical circuits of direct current against overloads and short circuits. Number of poles 1 Rated current 0,5 A Disabling ability 6 kA Feature o.. Number of poles 1 Rated current 1 A Disabling ability 6 kA Feature off.. Number of poles 1 Rated current 1,6 A Disabling ability 6 kA Feature o.. Number of poles 1 Rated current 10 A Disabling ability 6 kA Feature of.. Number of poles 1 Rated current 16 A Disabling ability 6 kA Feature of.. Number of poles 1 Rated current 2 A Disabling ability 6 kA Feature off.. Number of poles 1 Rated current 20 A Disabling ability 6 kA Feature of.. Number of poles 1 Rated current 25 A Disabling ability 6 kA Feature of.. Number of poles 1 Rated current 32 A Disabling ability 6 kA Feature of.. Number of poles 1 Rated current 4 A Disabling ability 6 kA Feature off.. Number of poles 1 Rated current 40 A Disabling ability 6 kA Feature of.. Number of poles 1 Rated current 50 A Disabling ability 6 kA Feature of..